The Wheelersburg 11-12 year-old Softball All-Stars with their state championship banner. The Wheelersburg 11-12s celebrate following AndiJo Howard’s strikeout that sealed the state championship-winning 3-0 result over Canfield. AndiJo Howard winds up to throw a pitch. WEST PORTSMOUTH — Total dominance. It’s hard to find teams that accomplish the definition against top-level competition because said competition is so good. The Wheelersburg 11-12 All-Stars, however, did that at the Ohio Little League Major Division (12U) State Softball Tournament. In three matchups against two of the best softball traditional powers in the state at the 11-12 ranks, Canfield and Tallmadge, Wheelersburg outscored their opposition by a 10-0 count, allowed just four hits across the three-game set, and scored six of their 10 runs with two outs on the scoreboard. 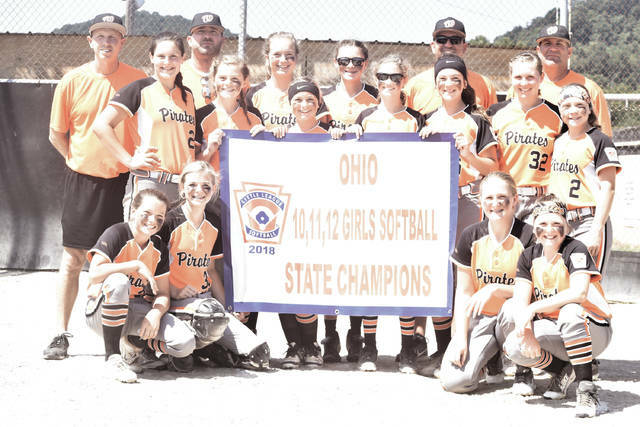 That’s quintessential Wheelersburg — and the ideal recipe for the Lady Pirates’ fourth straight state title in that age bracket, which came via a 3-0 victory over Canfield in the state title bout on Monday morning at Doc Singleton Park in West Portsmouth. In that title-winning result, it was, as the previous paragraph describes, a performance that has become typical of a team associated with Wheelersburg. AndiJo Howard threw a complete game two-hitter and stranded six Canfield baserunners. Rileigh Lang went 2-for-3 as the team’s leadoff hitter and took advantage of two misplays by the Canfield 11-12s while converting said mistakes into runs. And Haley Myers added in her own two-out RBI base knock in the top of the sixth frame that added a crucial insurance run. When you add that in with a defense that only committed one error over the entire contest, the result is, as Dusty Salyers describes, amazing. From the outset, Wheelersburg proved to come up big in high-intensity moments as Lang, who led off the contest, launched a triple to center field to immediately put Wheelersburg in business, and the threat of her speed allowed fellow teammate and two-hole hitting Sydney Salyers to reach second base on a rare bunt double. The former then scored on a wild pitch as the Lady Pirates took a crucial 1-0 advantage after an inning of play. Lang, who has been electric throughout the district and state level, capped off her play against Ohio competition in style by going 2-for-3 with the leadoff triple and two runs scored for the Lady Pirates. When Wheelersburg developed its early advantage, Howard went to work and proceeded to make quick work of the Canfield lineup. 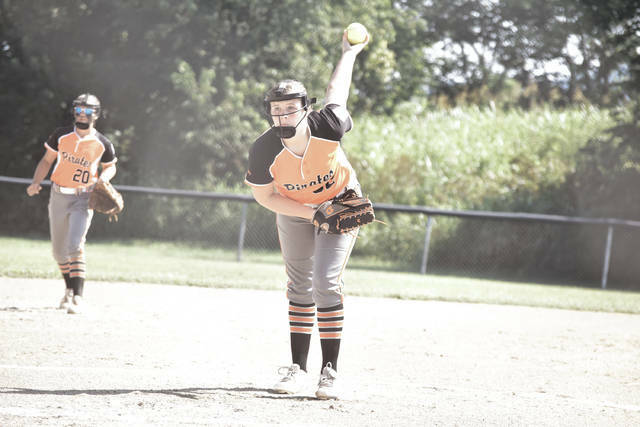 The ace of the ‘Burg 11-12s survived three free passes by striking out nine batters for a three-to-one strikeout-to-walk ratio and by showing the poise that already has the standout arm raising eyebrows across the state. With Wheelersburg’s defense playing as solid as a rock, the Lady Pirates’ only concern was finding a way to add onto its advantage. The Lady Pirates did just that on two huge occasions, when Lang singled to right field with one out in the top half of the third. Two batters later, Sydney Skiver singled back up the middle with two gone in the frame, and Lang, who advanced to third on the hit by Skiver, raced on home after a throw from the outfield sailed past the field of play and well off to the right of the third base bag. In the sixth frame, Skiver got the rally going again by drawing a walk, and when Emma Smith moved to second base on a 5-3 groundout after being inserted as a courtesy runner for Skiver, Myers came up large with an RBI base knock to right field that scored Smith to give Howard a comfortable margin with which to work with in the final frame. Canfield made a late rally as a walk and a base hit with two outs allowed the tying run to come to the plate in the bottom half of the inning, but Howard recorded a strikeout to seal the result and the state championship for the Lady Pirates. 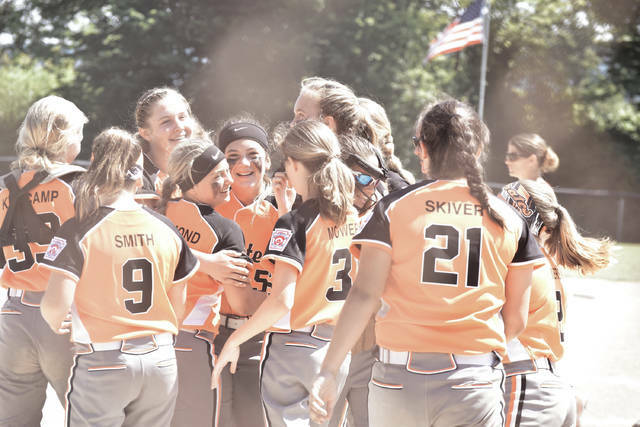 With the victory in the Ohio 12U State Softball Tournament, Wheelersburg will advance to play in the Little League Softball Central Regional, which will run from July 23 to July 27 in the Indianapolis, Ind. area. The Lady Pirates, whose 11-12s finished as the third-place unit out of the nine teams participating in the tourney in 2017, will get an added bonus because they’ll get to scout their pool play opponents, which will be the Kentucky State Champion and the Indiana State Champion, on Monday before starting pool play the following day.